This is a 6 second video at 30 frames per second for a total of 180 frames numbered from 1 to 180. A helicopter flies in a straight line at constant speed and height past a single camera position. Assign clock to the STEP variable instead of using clock directly in your POV source code. This makes it much easier to render exactly the frame you want in single frame mode and to have the frame look identical in both single frame and animation modes. Camera position Orbit shoots the scene from high up. Set the rough start and end positions of the helicopter using this view. This view is good for answering the 'Where is the Helicopter?' question. Camera position Zero is close to the final position, but set at right angles to make it easier to find and position the helicopter. Start and end positions are tuned. The middle position is set. Camera position One is set to make use of a diagonal which is not as boring as camera position zero. The helicopter flight plan is finalized. The Colored Balls visually map out x,y,z dimensions and serve as markers. They do not appear in the final rendering. Lighting is very time consuming and the most difficult thing of all. This is the main file for the final run. 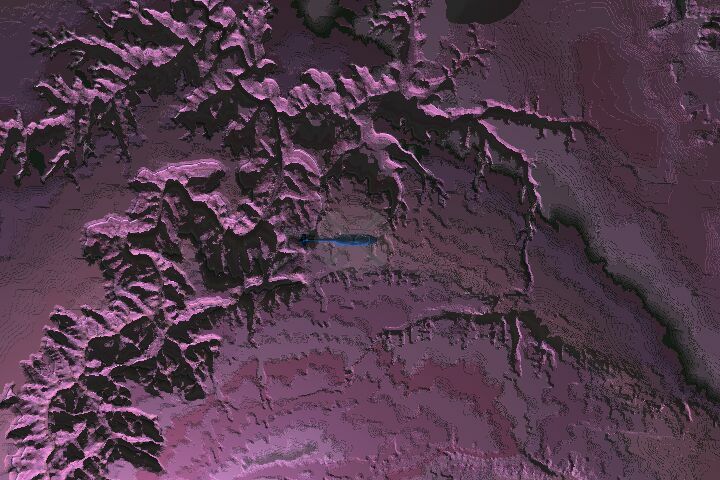 This is the gif height map of the grand canyon used to texture the surface. This is the helicopter. The rotors rotate based on clock. Removes the bitmap files. They take a lot of space, and bitmaps with different resolutions left over from sample renderings will break bmp2avi. Runs bmp2avi. Converts the bitmaps into a huge uncompressed avi that is unplayable, but a perfect input file for Windows Media Encoder. This converts the huge .avi into a playable .wmv file that is much much smaller. Use the 'Convert A File' Wizard. 180 Frames rendered at 1280x720 resolution with POV-Ray 3.7 Multi-core Beta, assembled with bmp2avi at 30 Frames per second and compressed by Windows Media Encoder 9 to a 5 Mbs stream. 180 Frames rendered at 320x240 resolution. 180 Frames rendered at 1280x720 resolution.